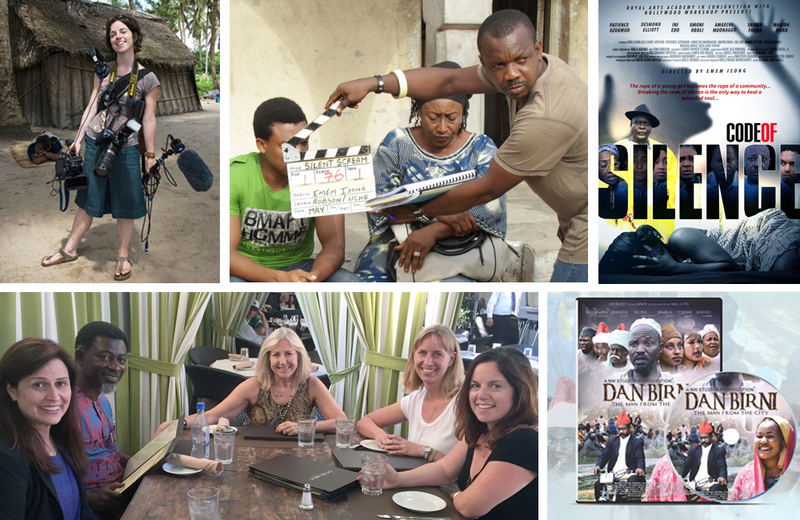 Aimee Corrigan (photo, top left), co-director of Nollywood Workshops; production on Code of Silence, and promotional poster for the film; with funding from UNICEF, our partners in Nigeria also created a series of short Dan Birni videos to foster trust between health workers and the public in northern Nigeria; to kick off projects, HH&S organized a planning group that brought together TV producer-writer Jennifer Cecil, Nollywood Workshops co-director Bond Emeruwa, HH&S Director Kate Folb, TV writer-producer Sarah Watson and Aimee Corrigan. With guidance from HH&S, Nollywood Workshops (NW) consulted with dozens of TV and filmmakers on a wide variety of health topics some of which have resulted in aired storylines on popular Nigerian TV. HH&S and NW also co-produced a Nollywood feature film, Code of Silence, which addressed sexual assault. HH&S connected the Nollywood screenwriters with established Hollywood writers to collaborate on the final script. The film features top Nollywood stars and was released theatrically in Nigeria in August 2015, and later on DVD/VCD. It is also available on Iroko TV and more recently is being aired on AfricaMagic throughout the continent. Code of Silence has reached over 5 million viewers in Nigeria. 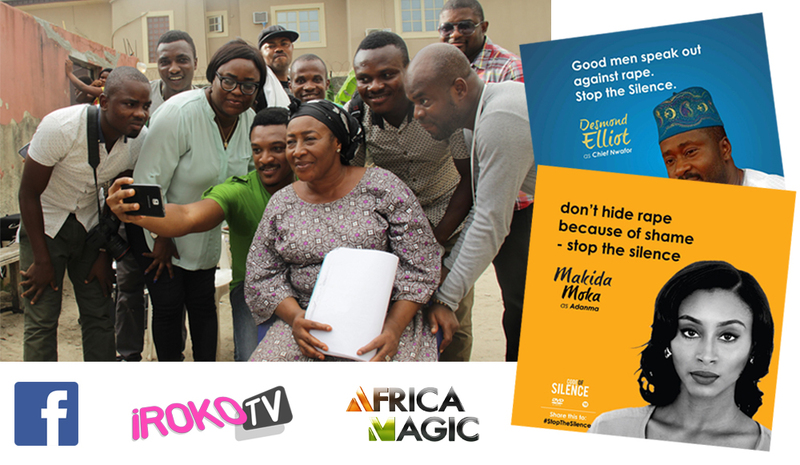 Code of Silence cast and crew take a selfie; ads in social media promoting film's topic; Nigeria is Facebook's largest African market. Bond Emeruwa (in sunglasses) directs video for Dan Birni series; cast members from Kannywood take a break on the set. With funding from UNICEF, our partners in Nigeria also created a series of short videos to foster trust between health workers and the general public in the north of Nigeria, and to convey important health information through entertainment. The first series of short videos—which together comprise a full movie—featured information on polio and the polio vaccine. The short skits are performed by two well-known comedians from Kannywood (cinema of northern Nigeria) with other Kannywood stars throughout. To date, there have been over 5 million downloads of these shorts. In addition, 120,000 copies of the entire film have been released on DVD. Dan Birni has an active Facebook page, and we’re seeking support for the next series of videos.